A few weeks ago, Marcus Lindblom logged onto TwitchTV. He found someone playing Earthbound, and he watched them stream for a while. Every time they smiled in the right place or laughed at the right joke, he felt a jolt of vindication. Validation. Eighteen years later, he could finally see people enjoying his work. This piece originally appeared 8/23/13. We’ve bumped it up in honor of Earthbound’s release on the Virtual Console for New 3DS today. In 1995, Earthbound was a dud. Critics panned it—”nauseatingly cheery,” wrote one reviewer—and sales were disappointing thanks to a bizarre marketing campaign and graphics too cartoonish for many American gamers’ tastes at the time. When Lindblom, who spent a grueling four months writing the English text for almost all of the quirky role-playing game, saw the reviews and sales figures, he was crushed. But over the past few years, something unlikely happened: People who had grown up with Earthbound began to tell their friends how charming it was. Buzz began to build. And gradually, Nintendo’s quirky RPG became a cult classic. On July 18, Nintendo re-released Earthbound in North America. For the first time in almost two decades, Lindblom could directly watch people enjoy what he’d done. It no longer felt like a failure. Like many in the gaming industry, Marcus Lindblom accidentally fell into what would become a career-launching gig. Raised to a traditional, middle-class family—”It was almost an Earthboundy kind of upbringing,” he told me—Lindblom got bored during his college days and dropped out, marrying a woman and moving to Japan for what they thought would be a few months. It turned into four years. In 1990, Lindblom and his wife came back to America, and he went back to school. He took a job at a Nintendo call center because it fit into his schedule; he could get up at 4am and work for a few hours every day before class, a process he describes as energizing. He’d go into Nintendo’s offices in Redmond, Washington, where he’d work customer service and field calls from people desperate to get through difficult chunks of Mario and Zelda games. After finishing school, Lindblom moved over to Nintendo’s game group, taking the all-purpose title of Software Analyst. Although Nintendo’s development teams are all based in Japan, both then and today, their American headquarters plays an important role helping translate, polish, and produce games for Western shores. 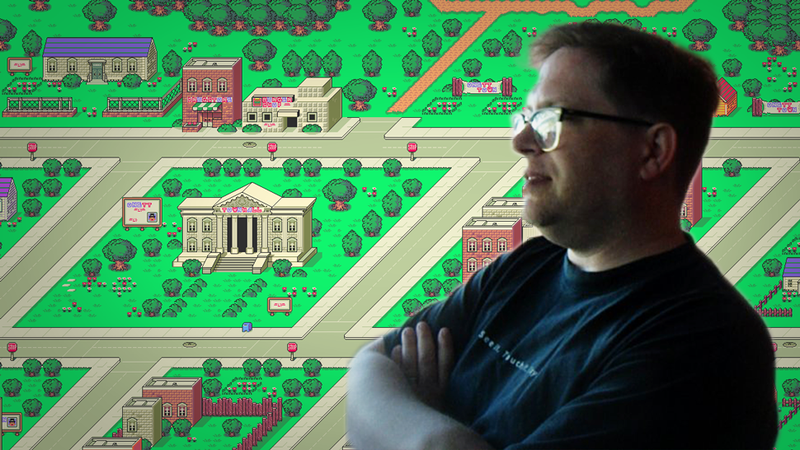 Lindblom would be part of that, working on games like Wario’s Woods, and eventually, a niche little game called Mother 2, a low-priority RPG that never had quite as much clout as bigger titles, like Donkey Kong Country. The first game, Mother, had come out for the NES in Japan back in 1989. Nintendo never brought it here, and to avoid confusion, they retitled its Super Nintendo successor from Mother 2 to Earthbound. When Lindblom started, a Nintendo writer named Dan Owsen (still at the company today) had already written some 10% of the script, including some of the game’s most iconic phrases, like “say fuzzy pickles,” a mantra recited by the bearded photographer who intermittently descends from the sky in order to record your party’s progress. But Owsen moved on to another game, so the bulk of the work was left to Lindblom and a Japanese writer named Masayuki Miura, whose role was to help Lindblom understand what was going on in the game. They worked off of paper. A translator would go through the Japanese script and send Lindblom rough English translations, while Miura would help him understand the tone and message that Earthbound director Shigesato Itoi and crew were trying to convey in each scene. And Lindblom wrote. A lot. From jokes to combat messages to items and weapons, the amount of text in a role-playing game like Earthbound would boggle the mind of your average Hollywood scriptwriter. Lindblom says he considers Earthbound to be his finest accomplishment. Ask an Earthbound fan what he or she likes most about the game, and you’ll probably hear something about that feeling of innocence, that sense of whimsical adventure, that humor and charm and wonder around every corner of the game’s beautiful 2D maps. In the hands of a less competent writer, things might have turned out differently. Beautiful, poignant moments of Earthbound’s story—like, for example, the Mr. Saturn coffee break—might not have been nearly as effective. But it was tough, Lindblom said. To hear him describe the process is to wince at how difficult it must have been. “In terms of the text alone, one of the biggest challenges was working in a large text file that was, for lack of a better phrase, kind of like free-form jazz,” Lindblom said. “Oftentimes, it was really difficult to know where lines appeared in the game, what may have come before or after, and what special context was needed to really know how to phrase things best in English. The humor works, to be sure. Instead of the elves and orcs of your typical fantasy game, monsters in Earthbound have names like “New Age Retro Hippie” and “Unassuming Local Guy.” Characters frequently snark and break the fourth wall. There are silly puns all over the place. Lindblom also scattered little easter eggs throughout the game. He named a character after his daughter Nico, for example. And he threw in little secrets wherever he could. Over the past two decades, Earthbound fans have developed their own sort of lore, coming up with theories to explain puzzling questions. For example, fans guessed that Nintendo’s reluctance to re-release the game in North America—at least until last month—was because of music licensing issues. Earthbound samples segments from The Beatles and Chuck Berry, among other artists. But Lindblom says that never even came up when they were working on the game. Lindblom also shot down the infamous “abortion theory” that has been floating around the web for a while now. It alleges that Giygas, the game’s main baddie, is actually a fetus that you are forced to abort at the end of the game. One theory that is most definitely true: censorship. Nintendo had strict rules for bringing games to U.S. shores back in the 90s, which meant that Lindblom had to change a few things—and ask Earthbound’s Japanese artists and programmers to change a few more. Alcohol was replaced by coffee, red crosses were removed from hospitals, and Ness was given pajamas for his dreamy sojourn through the mystical world of Magicant. After Earthbound, Lindblom worked on a couple of other games at Nintendo, and then he made his way to a few other studios. He worked at EA and Vivendi, and now he runs a company called Carried Away Games, where he and his team are working on games for iOS and Android. But he’s still most proud of what he helped create in 1995. He’s been talking to gaming reporters about his work on Earthbound, and he spends a lot of time tweeting and retweeting articles about the old RPG. He says he’s amazed at how public perception has evolved over the years. “The rolling HP meter,” Lindblom said, referring to Earthbound’s battles, during which your characters’ health points are on a meter that gradually rolls down when they’re damaged. If you’re quick enough, you can actually prevent a character from dying, even if he or she has been hit for all of their health. In 1995, Lindblom couldn’t watch people enjoy what he’d done. He couldn’t get direct feedback on the Internet. All he could do was read the magazine reviews, crushed, wondering why people didn’t seem to appreciate all the work he had put into Earthbound. There’s a happy ending here: Earthbound is a success—Nintendo recently sent out a press release declaring that the game has been a top-seller on the Wii U’s Virtual Console. People love it. When I asked Kotaku readers who are playing Earthbound for the first time what they think of the game, the response was overwhelmingly positive. For good reason.